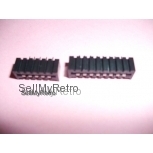 This is a set of two Molex connectors for the Sinclair ZX Spectrum motherboard (various models). These will also fit the Sinclair ZX81, as well as the Timex-Sinclair models (TS-1000, TS-1500 and TS-2048). Of course, not only do they fit the original rubber keyed 16K and 48K Sinclair ZX Spectrum Home Computer, they also fit the ZX Spectrum +48 and the +128 (toastrack model).